A walk around Frieth will show that during the second half of the 18th century new building was taking place. This may have been due to the fact that land in other parts of the country was being enclosed due to new and "improved" methods of farming and so people had to seek the relatively more open areas in which to settle. This was the time of building on the edges of commons. 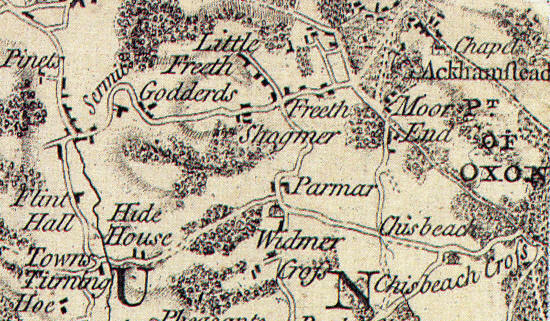 As far as Frieth was concerned the local Lord of the Manor (of Parmoor) was an "absentee" landlord. John D'Oyley's father died when he was young and he appears to have lived in London for much of his life, doubtless the family's grip on its possessions loosened. Added to this the Clayton family were Lords of the Manor at Hambleden and although they may have resided at the Manor House their lands and possessions were so vast that Frieth would have been very much "an outpost of Empire". How were these communities supplied with water? Little Frieth had pond water to use. There were three ponds at the top of the hill, one opposite School House, one by Mr. Fowle's garage and one on the lane to "Maiden Farm" (now wired off). 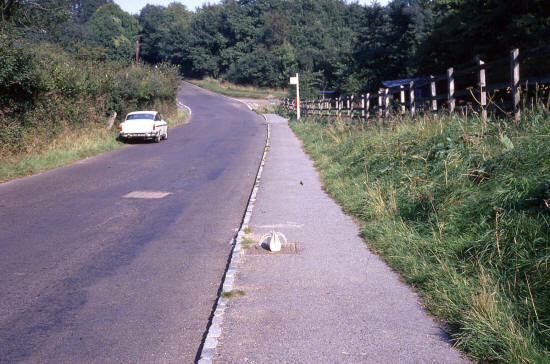 As explained earlier, a line of springs runs across Frieth Hill parallel to Ellery Rise and below it. One spring was on the hill, one was at Perrin Spring (just above the Prince Albert on the opposite side of the lane) and two in the field between. Water from the two former was used right up to the 1930's when mains water reached the village. These springs were often low, but were never known to fail completely and supplied the water for Great Frieth and the Perrin Spring areas. Later pond water and spring water were supplemented by rain water tanks as a source of water supply but I do not know when these were first used around here. The cottages at Little Frieth certainly did not have one until Canon Ridley had it dug. (The controversial one between Mr. Fowle's cottages and Mrs. Harbourne' s cottage near the public footpath). Canon Ridley was also responsible for the digging of the village tank with pump appliance opposite the Church (some time after 1848). There is at least one very deep well at Bagmore Farm, Parmoor House originally drew its drinking water from this source. This well is 132 feet deep, 6 feet in diameter and the water level varies between 98 feet and 126 feet. I have been told there are wells of some depth at Shogmore and Barlows, but how deep and of what type I do not know. Perhaps it would be appropriate to add a few words of explanation on the term "well" as it is loosely applied to four different types of water supply. ring water, these were very liable to contamination. 3. A bricked-up spring - this could be good or bad water according to whether the spring was a deep one or a shallow one. 4. A rain water tank, i.e. a bricked (or later concrete) tank collecting water run off from a roof. This water was good if the tank was completely sealed but equally liable to contamination if partially fed by seepage from a surface "spring". Have you a well in your garden? How deep is it? What type is it? Sometimes workmen who dug wells carved a date on a brick. I have not been able to establish which of these houses in the seven places listed were free-holdings, which were tenant farms and which were labourers' cottages but the whole was a farming community. Country folk were self-supporting having no money for, and little use of, town goods. By our standards they were desperately poor, depending on the field crops for very survival, but by comparison with folk who had migrated to the towns and were living in hovels hard by the factories, country folk were better off. A study of copies of Parish Registers from Hambleden, Fingest, Turville and Medmenham from their beginning up to 1800 show that the same names recur in more than one parish suggesting that labour moved about at least within the limited area of the Hambleden Valley and intermarried. The "gentry" did the same and most of the families of the local Manors were linked by marriage.